I will buy any and every book you write – and often extra copies for gifts. Seriously. I think your work is fantastic. Shade’s Children chilled me to the core years before dystopian fiction got big. My copies of the middle grade fantasy Keys to the Kingdom books are well-loved and much-read. And I don’t think I can say it any better than Amanda of Dead White Guys did on twitter: “The best YA trilogy I've ever read was Garth Nix's Sabriel. I don't know why I just remembered that it existed, but it owned my face.” Also, you sent me a signed postcard once (thanks! ), which I still have (not creepy, not creepy at all). 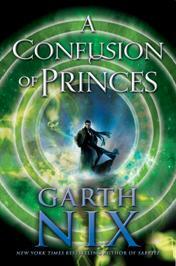 As expected, I loved your newest sci-fi YA title, A Confusion of Princes. Thank you for writing wonderful books! As A Confusion of Princes opens, the reader is introduced to Khemri, an altered and improved human being whose fate it will be to rule as Prince in a vast Empire – as long as he isn’t killed first. Khemri has been brought up his entire life to believe in his own importance, and his first steps into the universe he is sure he was born to dominate are an unpleasant shock. The book follows his journey from an egotistical and selfish novice Prince to an adult, with understanding and capabilities that do justice to his purpose. The story explores Khemri’s coming-of-age on intellectual and emotional levels, and manages to be a fully entertaining sci-fi adventure at the same time. In a word? Awesome. This book is: a first-person narrative from a male perspective, hard* sci-fi, and all about character growth (Prince Khemri goes from blank, selfish slate to somewhat patient, empathetic, and humble over time? Be still my heart!). Also: there’s alien action, sweet star ships, manufactured beings, mind-controlled servants and made-from-scratch beasts, and of course the battles and adventures and impossible tests that go into the making of any space opera worth its salt. Have I mentioned the world-building? The world-building was REALLY GOOD. There you have it. Oh, you need specifics? Okay. Nix took sci-fi clichés and twisted them into new configurations. The Empire is arranged along a strict social hierarchy and surveillance, with no real ‘religion’ (no Star Wars-type Force, in other words). But Princes and Priests and the Emperor come from somewhere, and the long-abandoned history of Earth makes appearances in the narrative. The morality and purpose of Princes is also an interesting theme – as is Khemri’s evolution in that area. And I am now fascinated by movement via wormhole jumps and the different kinds of Tek – I want more! In all, Nix’s latest is satisfying for a couple of reasons: complex characterization and exciting plot being two of them. But the best barometer of its appeal (to me) remains the fact that my 21-year-old brother called to discuss how much he enjoyed it. One day after getting it in the mail, I might add. That is a good book. Recommended for: fans of science fiction and first-person narratives, those who have enjoyed the recent spate of superhero films and books, and anyone with a taste for excellent characterization in YA fiction. *Liviania pointed out the difference between hard sci-fi and this book's characteristics in the comments. Thanks for setting me right! I loved Khemri's personal growth as well. But I have to tell you, CONFUSION isn't hard sci-fi. Hard sci-fi is rooted in actual technology and characterized by info dumps where the author explains actual science and extrapolates from there. CONFUSION's tech is of the magic-by-a-different-name sort. Liviania: Thanks for setting me straight on that point. I didn't have the terms straight in my head. Have updated my post with a tip of the hat to you! I have this one out from the library right now, and I did so very much want to read it before BEA...but it isn't going to happen. SIGH. I'm looking forward to seeing you on Monday!